One person is feared dead and several were wounded in the shooting incident, according to police spokesman Joost Lanshage. 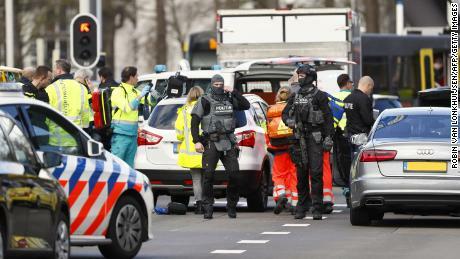 Dutch authorities are considering “a possible terrorist motive” for the shooting, which happened in 24 October Square at 10:45 a.m. (5:45 a.m ET) on Monday, Utrecht police said on Twitter. Police say Gökmen Tanis, 37, who was born in Turkey, is wanted following the incident; they have asked locals to contact authorities immediately if they see him. The image, which appears to have been taken from CCTV footage on board the tram, is time stamped at 10:41, roughly four minutes before the incident took place. The shooting is now over but three rescue helicopters have been sent to the scene — which has since been cordoned off — to “monitor” the situation, Lanshage added. Photos from the vicinity posted on social media show the tram stopped in its tracks with police tape locking down the area and multiple emergency vehicles nearby. CORRECTION: This story has been updated to correct the duration of the critical threat level. CNN’s Stephanie Halasz, Arnaud Siad and Gianluca Mezzofiore also contributed to this report.